The article describes the clinical indicators of quality of care for patients with ST-segment elevation acute coronary syndrome (ACS), developed on the basis of current clinical guidelines and proposed for a systematic evaluation of the quality of treatment in clinical practice (clinical audit). For each indicator definition and calculation scheme is presented. The possibility of calculation of these indicators on the basis of the Federal registry of ACS is demonstrated. Posnenkova OM, Popova YV, Gridnev VI. System of clinical indicators for patients with ST-segment elevation acute coronary syndrome. Cardio-IT 2016; 3(2): e0202. 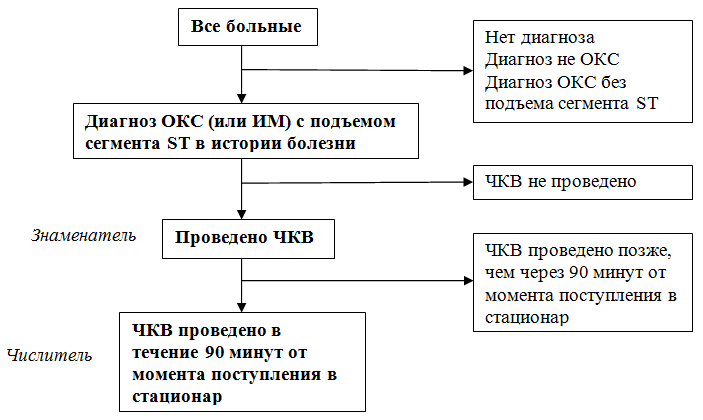 Oschepkova EV, Dovgalevsky PYa, Gridnev VI, et al. Key data elements and definitions of the Russian acute coronary syndrome registry database. Cardio-IT 2014; 1: 0201. 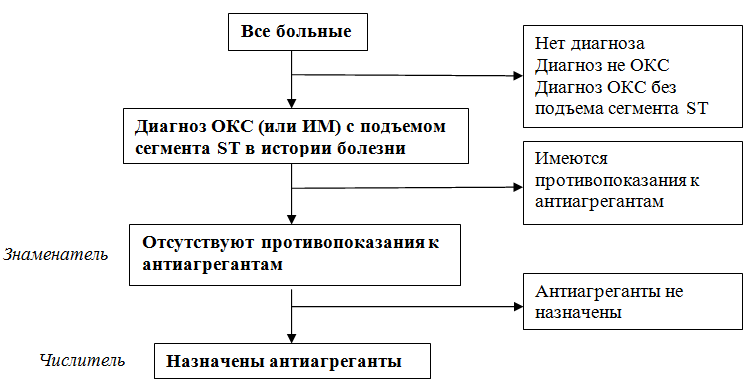 Russian https://dx.doi.org/10.15275/cardioit.2014.0201. Steg PG, James SK, Atar D, et al. ESC guidelines for the management of acute myocardial infarction in patients presenting with ST-elevation. Eur Heart J 2012; 33(20): 2569–2619. https://dx.doi.org/10.1093/eurheartj/ehs215. Posnenkova OM, Kiselev AR, Popova YuV, et al. Novel approach to evaluation of medical care quality delivered to patients with ST-segment elevation acute coronary syndrome: course to clinical result. 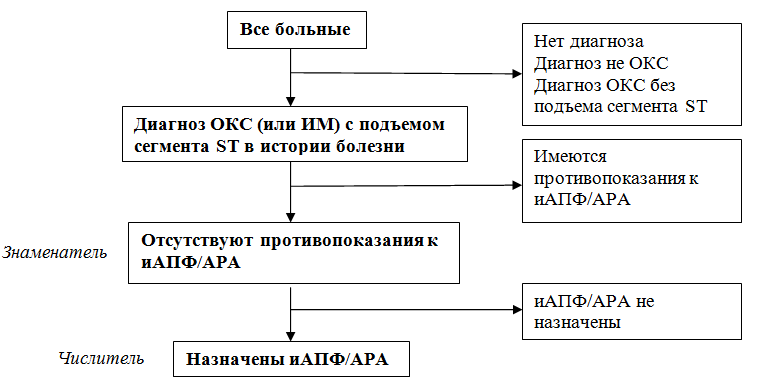 Saratov Journal of Medical Scientific Research 2014; 10(3): 408–413. 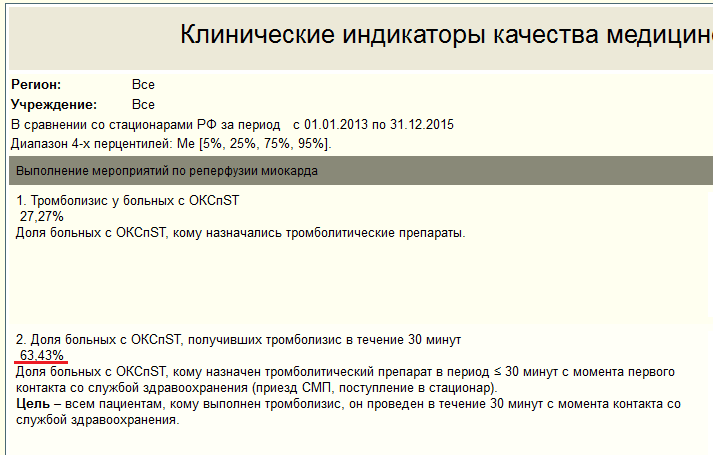 Russian http://www.ssmj.ru/2014/3/408. Posnenkova OM, Kiselev AR, Duplyakov DV, Khokhlunov SM. 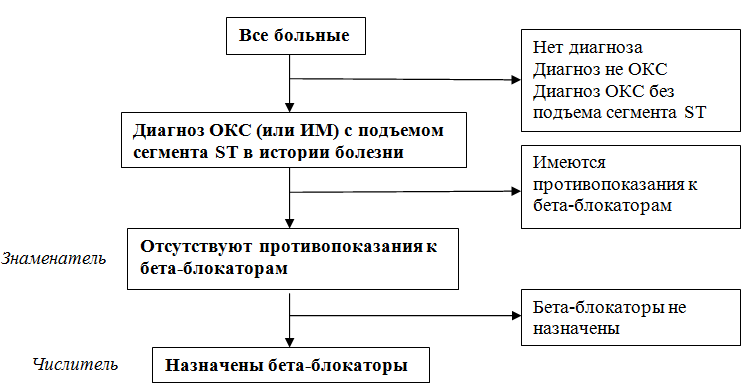 Using the Russian system of indicators for healthcare quality assessment in patients with acute coronary syndrome with ST-segment elevation: a step towards the practice of public reporting on quality. Cardio-IT 2014; 1: 0401. Russian https://dx.doi.org/10.15275/cardioit.2014.0401. © 2016, Posnenkova O.M., Popova Y.V., Gridnev V.I.